On Cosmos and working through the math. K and I have been watching that new Cosmos television show. The library had the whole set of DVDs, and she and I have both been tired enough that it’s felt nice to zonk out with some television in the evening while N is having her fifth dinner. K really likes the show. Things were perhaps stacked in her favor: she is a scientist, she likes Neil deGrasse Tyson, and she teaches Earth & Space Science, which covers a lot of the same topics as the Cosmos show (and is, incidentally, not the field of science either she or I was trained in – E&SS just happens to be what you need to teach if you want to work with people who get signed up for the most introductory level science class in this state. Elsewhere I think the equivalent course is Integrated Chemistry & Physics or something?). Whereas I have mostly failed to enjoy the show as much, even though it’s clear that a lot of people worked very hard on it and it has some very redeeming qualities, too. So, last night we watched the episode about Faraday’s experiments with electricity and magnetism. And then this morning I went berserk and had to set N up for some self-directed play while I watched a video deriving the Maxwell equations. Which is something I used to know, and probably still should, but almost a decade has passed since I last used them. And when they were flashed up on the screen at the end of the Cosmos episode, I realized that I couldn’t think through the derivation. That felt sad. I’ve already been feeling sad about being very unpracticed with my math these days, to the point that shortly before N was born I picked up a book on differential equations and another covering specifically Fourier transforms. I did not work through very much of either before she was born and have not picked them up since – as it happens, taking care of a baby can be a fair bit of work. 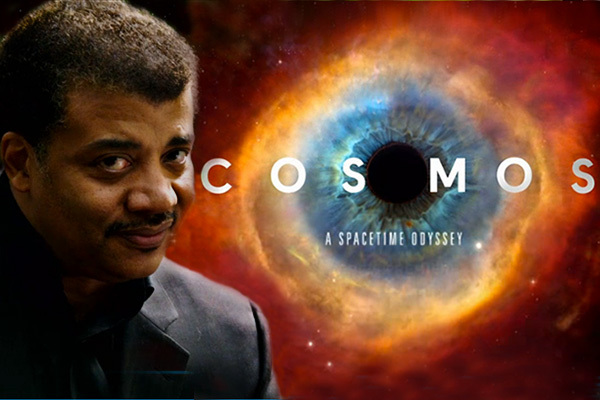 But my reason for feeling uncomfortable about Cosmos isn’t just that it reminds me of my own current ineptitude. For me, the problem is that the show often seems to be contrasting stories from mythology, often Christian mythology, against stories as elucidated by science. But all of it is presented without math, and much of it is presented without data of any kind, or even descriptions of the necessary experiments. I have to admit, the particular episode that made me sad did a better job of that than most – many of Faraday’s experiments were described. But, still, the Maxwell equations were tossed up at the end with no attempt at an explanation. And I know that mathematical and scientific literacy is often described as, um, not good in this country. And television is not a very good medium for conveying math. I’ve watched some math videos online (Dr. Arthur Mattuck at MIT made some charming ones), and, yes, sometimes you might space out, or maybe want to pause them, or glance at the screen and read an equation wrong and feel confused. But not everybody can pause broadcast television. And a lot of mathematics presupposes familiarity with basic concepts that many people haven’t had a chance to feel comfortable with. But the problem is, in my opinion, that science without math is very akin to mythology. It becomes an expert telling you what you ought to think because he happens to be blessed with great truths, either because he can do the math or because he has studied his bible or communed with god or read the portents from an eagle overhead. I am teaching you, and you should believe. Whereas I think that science should be presented more humbly. Yes, to my mind, having (once upon a time) worked through the math, science is more real than any religious claims. But for someone who has not worked through the math, and currently can not work through it, I can see how scientific or religious claims would seem like equal mysteries. You have to trust an expert. Maybe you choose an expert in a white coat, maybe you chose one in a black cassock. So I would much rather see science outreach like Cosmos attempt to guide people through the details – this is how the math works, and these are resources you could consult if this is hard, and these are experiments that you could do to reproduce these findings. Which is hard, obviously. I am (was?) pretty good at math, but I don’t have the training to follow serious astrophysics. I did well with the physics of small things (quantum mechanics) during college and graduate school, but I’ve never studied the physics of big things. I don’t really know gravity, for instance. That’s something I’d like to take a few courses in, after I finish the novel I’m working on. So, sure, there is a lot of complicated math involved. But I’d like to think there are better ways to convey a respect for people’s lack of exposure to math than trying to convey science without it. Obviously, it’s tricky. I’m not trying to argue that the team that made Cosmos didn’t try very hard, or aren’t clever, or anything like that. I’m just not super happy with the final product, even if I couldn’t necessarily do it better. Like, okay, the introduction to Christian Rudder’s Dataclysm seem to do a good job of walking cheerily through some basic statistics. And, sure, there are differences – statistics is an easier branch of mathematics for people to understand visually than some of the math you need for astrophysics, and, more importantly, Dataclysm is a book, which means there’s less worry that someone will get bored and change the channel during a brief math interlude – but I felt as though Rudder conveyed a more respectful attitude about wanting his audience to know where his claims were coming from. And, right, it’s not as though this problem – trying to convey science sans numbers to non-scientists – is unique to Cosmos. I feel a lot of similar frustration in reading editorials by scientists or medical doctors regarding the recent upsurge in Americans opting out of vaccines. Which, again, I should make clear: I am a scientist. I have been vaccinated against many diseases. My daughter has received all her recommended vaccines on time. But my impression is that scientists and medical doctors promoting vaccines do not always show sufficient sympathy. Like, okay, there was a research paper claiming that vaccines cause autism, which I am not linking here. There are research papers claiming that vaccines do not cause autism. Sure, there are more of the latter, but for someone without enough scientific literacy to evaluate the data for themselves, you’re stuck picking someone to trust. And, honestly, scientists and medical doctors have done some pretty terrible things, often in the guise of vaccines – you could have a pretty unpleasant weekend reading about some of these in Against Their Will: The Secret History of Medical Experimentation on Children in Cold War America. So there are reasons why someone who was just picking whom to trust would not choose the doctors. So, it’s not that I think the Earth is only 6000 years old. Or that I think anyone should believe that. I just think that, by trying to present science without math, the product is a competing narrative that still relies on faith. As with vaccines, as with climate change. And, who knows, maybe I am watching their show with the wrong attitude – maybe they were not hoping that people would watch and say, “oh, the Earth was actually formed 4.5 billion years ago,” maybe they were hoping that people would watch and think, “gee, that’s cool, I should learn how to figure this stuff out myself.” But that’s not the impression that I got. On time travel movies, particularly Timecrimes.